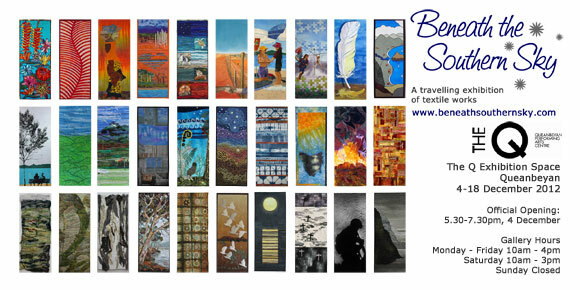 Beneath the Southern Sky @ Queanbeyan: 4-18 December | Canberra Quilters Inc. Textile works by CQ members Jenny Bowker, Dianne Firth and Helen Godden feature in the travelling exhibition Beneath the Southern Sky curated by Brenda Gael Smith. The exhibition continues on tour in 2012 to the The Q Exhibition Space, Queanbeyan, 4-18 December 2012. Come along to the opening night function at the Q from 5.30-7.30pm, Tuesday 4 December. Please RSVP to Brenda. « The UFO Pledge is coming back in 2013!